We are very excited to collaborate with cult fashion brand, RIXO London, to exhibit new work by Rose Electra Harris in their Carnaby Street Pop-up from 1st June to 14th July. 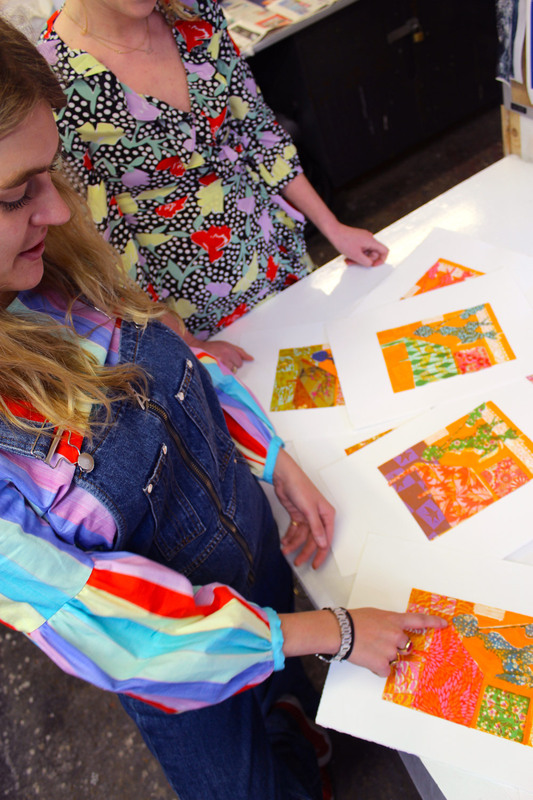 United by a love for riotous pattern, vintage fashion and furniture and Japanese design, Rixo have selected Rose's work to be displayed in the space in dialogue with their latest collection. The Carnaby Street boutique has been carefully curated by RIXO Founders, Henrietta and Orlagh (pictured left), featuring their latest summer collections, as well as vintage dresses and furniture: discover an immersive shopable boudoir. All of Rose's works from the pop-up are for sale exclusively through us for the duration of the pop-up and can be browsed in store and below. All Rose's artworks in the pop-up must be purchased online via us - click on the images below to shop. Collections can be arranged from the pop-up (click 'organise own courier' upon check-out), or we can arrange shipping for you at an added cost (select your country at check out for shipping rates). Rose Electra Harris is a London-based artist working predominantly as a printmaker, mostly in etching and screen-printing. Growing up with an antique dealing father, Rose has always been surrounded and intrigued by antiques and textiles. Decorative objects such as vases, chandeliers and free-standing baths are common motifs in her work. Her manipulation of the print medium is clever and unique; she has mastered a deliberately sketchy and uncalibrated technique which is just as much about the blank, negative space as it is what is depicted. Rose's work is a celebration of design and beauty in everyday objects. Read an interview with Partnership Editions Founder, Georgia Spray and Rose on Rixo London's blog "Humans of Rixo"